Knight of Wands (R) says you are feeling restricted, insecure and afraid to reveal your true self – your “real” feelings. Confused over your self – identity. Acknowledge your indecision and this lack of energy. Try something new. Stop allowing the opposition to confuse you – this only creates disharmony and disruption. When you experience frustration and indecision – follow your conscience and act accordingly. Allow yourself to experience the unlimited, inspired creativity that wants to be expressed and allow it to flow freely. A distortion – either to a greater or lesser degree, with the derivative problems. Obvious brilliance unfilled. Confusion. Possible philosophical/spiritual overload. A fundamental developmental block. How are you taking risks? In the first position: The call to defend may be heavy, but be confident your studies will not be sacrificed with this path. In the second position: If this is a person, they may not be backing you up at this time. At one extreme, you might be overzealous and missing the true inner mark while creating a great deal of smoke with your ritual observances. 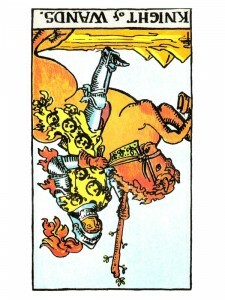 In the fourth position: As with the kings, this archetype can become distorted and block rather than foster love and creativity. At one extreme, the figure is idolized and real life will find it hard to compete. At the other extreme, the figure is loathed and by extension either all youth or all of a certain types of youth are not to be loved/trusted. In the fifth position: You may think adversely about this knight and he/she about you. In the seventh position: There may be fear of new revelations and what they might do to disturb your comfort with your present beliefs. In the eighth position: If this is a person in your environment, he/she may be throwing your affairs off center.